Long-term readers of these pages will recognise Tied & Tickled Trio as a much-loved old friend. One of the key groups in the notorious Weilheim scene (comprising Lali Puna and The Notwist among others), the line-up includes scene mainstays Micha and Markus Acher alongside fellow electronic jazz travellers Christoph Brandner, Andreas Gerth and Carl Osterhelt. 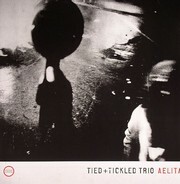 There's a notable shift in the group's compositional approach on Aelita, as characterised by a move towards more atmospheric, soundtrack-styled instrumentals. The opening 'Aelita 1' sounds somewhere between Swedish post-rockers Tape and the sort of library-style material that made the Harmonic 33 album from a couple of years back such compulsive listening. In a similar vein, 'You Said Tomorrow Yesterday' evokes an eerie dreamscape with its glockenspiel and dulcimer tones, but this time there's an added air of tension supplied by flickering electronic elements. There's a return to more familiar Tied & Tickled Trio terrain by the time 'Tamaghis' comes around. This marks the kind of sound the group have carved their signature in: it's echo chamber dub electronics with that added biting edge of jazz flair thrown in to the mix. However, it's not long before the band are heading back into darker recesses, with the more cinematic sounds that dominated the record's opening moments. The gorgeous 'Chlebnikov' reveals a combination of enigmatic, fairy tale melodies and subtle digital sound design, proving to be a superb example of all the group's finest attributes coming together in a single instance. Once 'Other Voices Other Rooms' starts up as we approach Aelita's final ten minutes, you can't help but get the feeling that the band have been saving up their trump card for the very end. It's at once dramatic and utterly beautiful, particularly in terms of the harmonic tricks played by those perfect chord changes, plus the whole piece is held together by a deft sense of developing sonic narrative, all propelled by the group's organically evolving instrumentation. A wonderful listening experience that comes very highly recommended indeed. - "You Said Tomorrow Yesterday"
- "A Rocket Debris Cloud Drifts"
- "Other Voices Other Rooms"